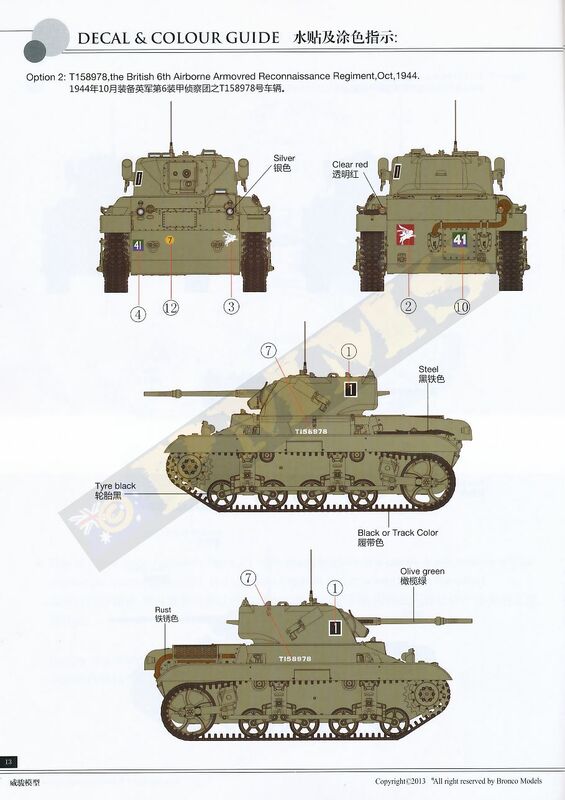 The T9 was designed by US firm Marmon-Harrington to a British specification for a light air portable tank to be used by the Airborne Divisions in NW Europe, after initial testing weight had to be reduced and along with other changes became the T9E1. 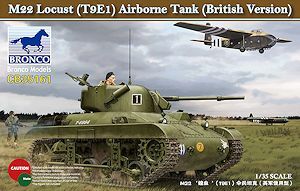 This was designated the M22 with the British giving it the name Locust and it weighed in at 7.5 tons, was armed with a 37mm M3 gun and co-axial M1914 cal.30 MG in a small two man turret mounted on a welded hull. 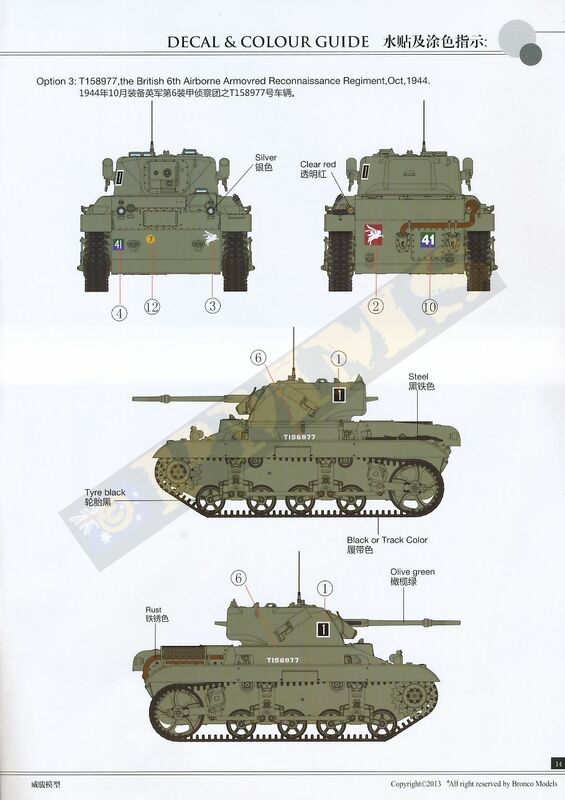 A total of 830 were built between late 1943 and early 1945 with 260 shipped to Britain, these being assigned to the 6th Airborne Armoured Reconnaissance Regiment who used the Locust in its only combat deployment during Operation Varsity in March 1945. Of the eight Locusts deployed, only two were serviceable after the glider landings and due to the overall poor performance was declared obsolete by the end of the War. 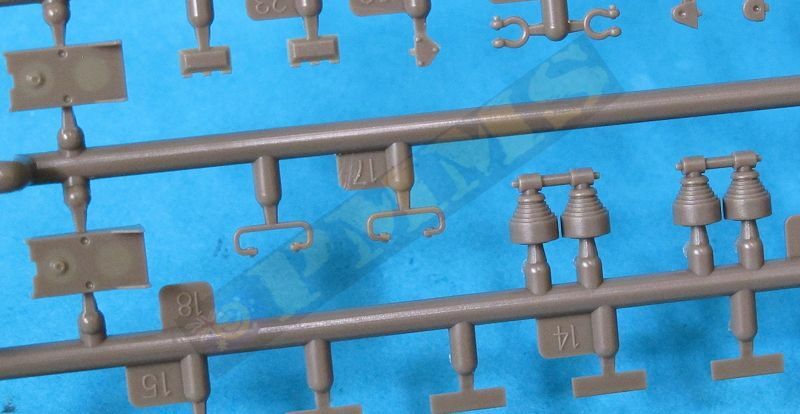 The kit as it comes is basically the US M22 Locust with the addition of the turret mounted smoke generators and the British style towing lugs on the front and rear hull to represent the British version of the Locust. 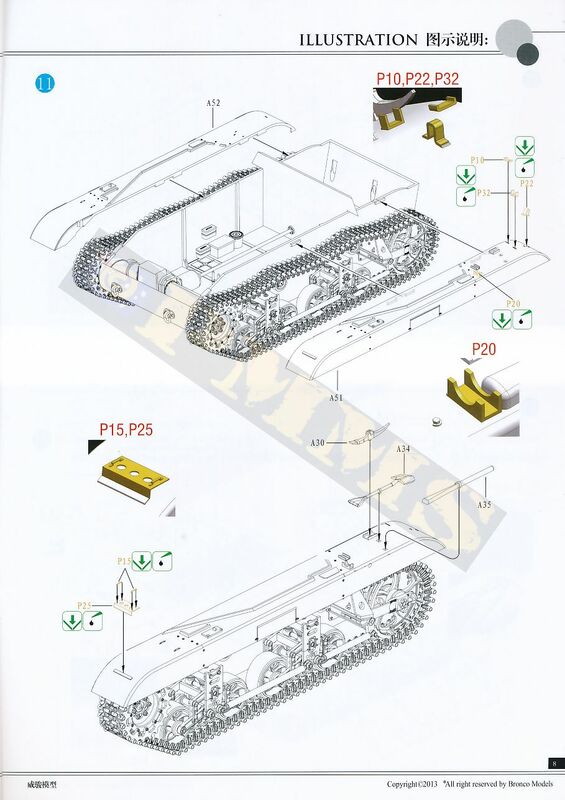 The main differences between the US and British vehicles being the removal of the large headlight bush guards, the additional of two smoke generators, one on each side of the turret and redesigned larger towing shackles front and rear of the hull as mentioned as well as some smaller details. 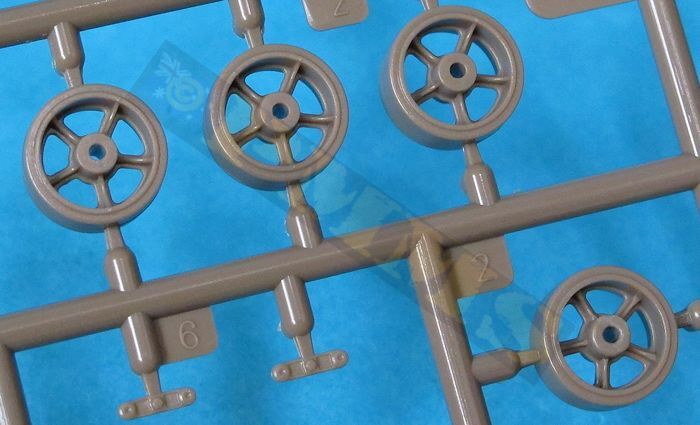 As the kit has the basic US features some minor modifications are required to the hull to properly represent the British version, more on this below. Another notable inclusion is the Littlejohn Adaptor moulded on the barrel tube (part F1), this was a devise screwed to the end of the British QF 2pdr gun designed to use the ‘squeeze bore’ effect to increase the performance of the 2pdr APDS round to that of the QF 6pdr gun. 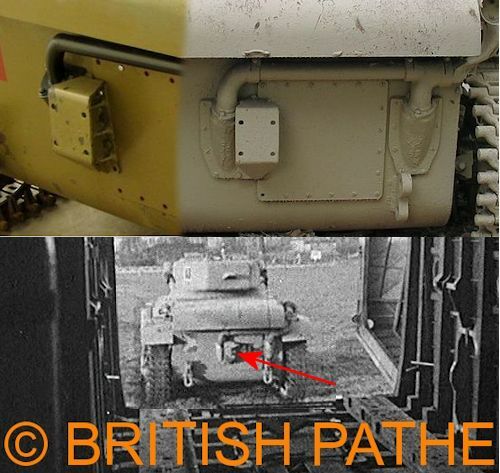 The Littlejohn Adaptor was tested with the 37mm M3 gun although not very successfully and there is a no real evidence it was used operationally on the M22. 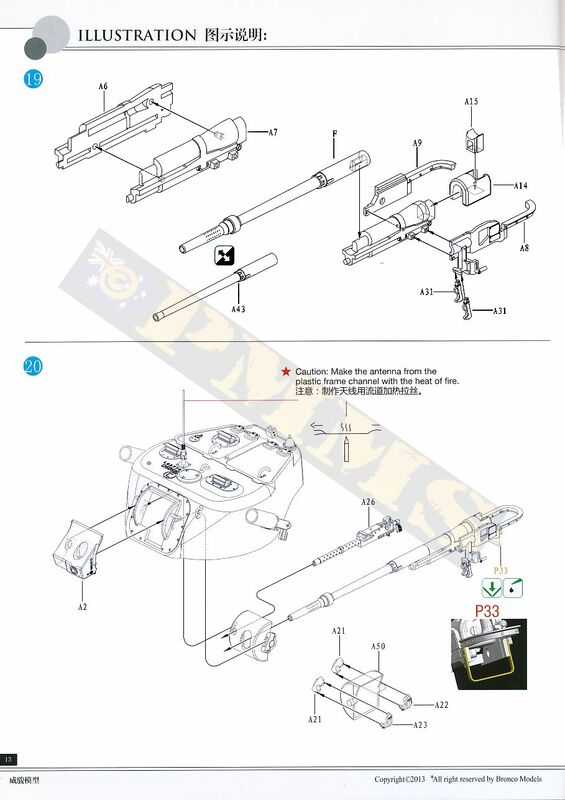 Available photos of the Locusts used during Operation Varsity clearly show the standard 37mm M3 barrel without the Littlejohn Adaptor and thankfully Bronco include the standard barrel in the kit (part A43) and this barrel should be used if building an operational vehicle. 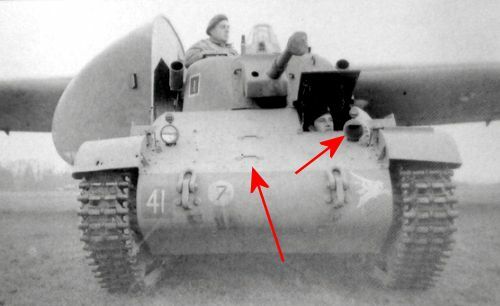 I have been unable to find any photos of the British M22 fitted with the Littlejohn Adaptor so using the standard barrel is clearly the preferred option unless building training or “what if” type models? This is a conventional tub with the sides, front and real plates included in the one moulding, this allows the curves of the front and rear underside to be included nicely, there are some fine mould lines to be removed but overall the hull is very cleanly done. 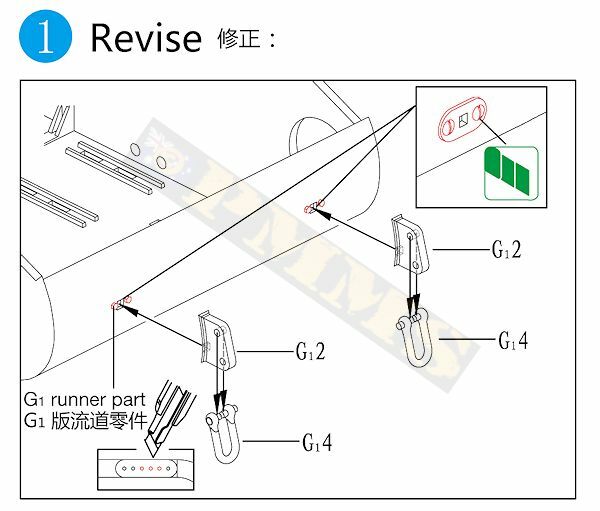 The sides have the suspension mounting plates and return roller mountings included while the rear plate has the exhaust mountings and engine inspection plate included along with the two small shackle mountings plates, the curved front hull also includes the tow shackle mountings but this is where the modifications are required for adding the British style tow shackles. 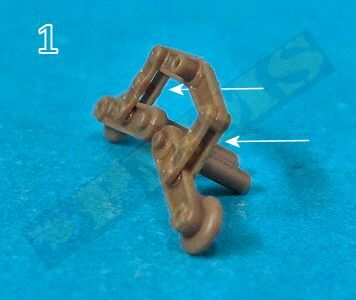 Before fitting the British style tow lugs you have to shave or sand off the US style lug mounting brackets as these are not used with the British lugs, once these have been removed the British style lugs can be added. 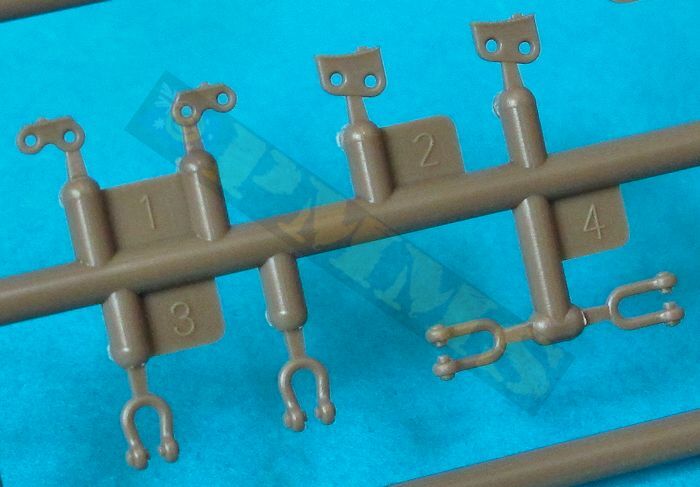 Basically you use parts G2/G3 in place of B19/B21 and G1/G4 in place of B20/B21 and to finish four small hex bolt heads have to be added to the front shackles, these were just used to fill the screw holes for the US lugs as the British lugs are welded to the hull. 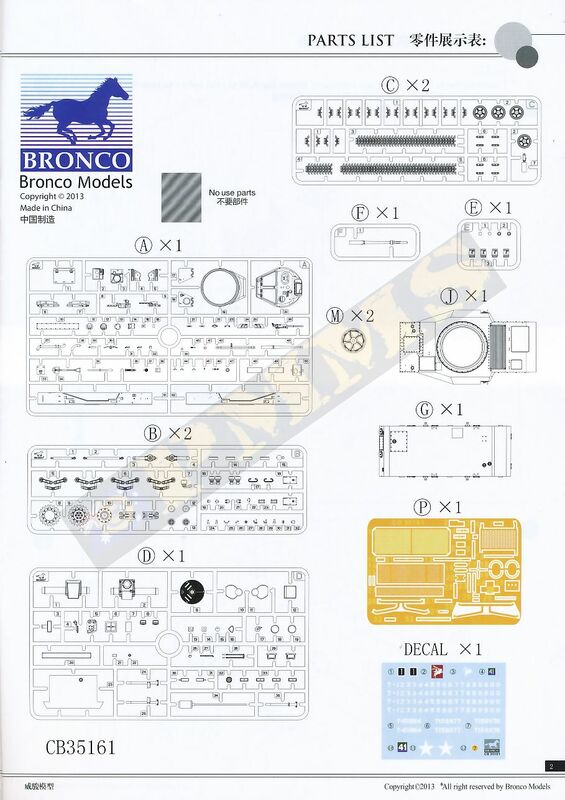 Note; Bronco will be including a small instruction addendum showing the modified towing lug assembly. 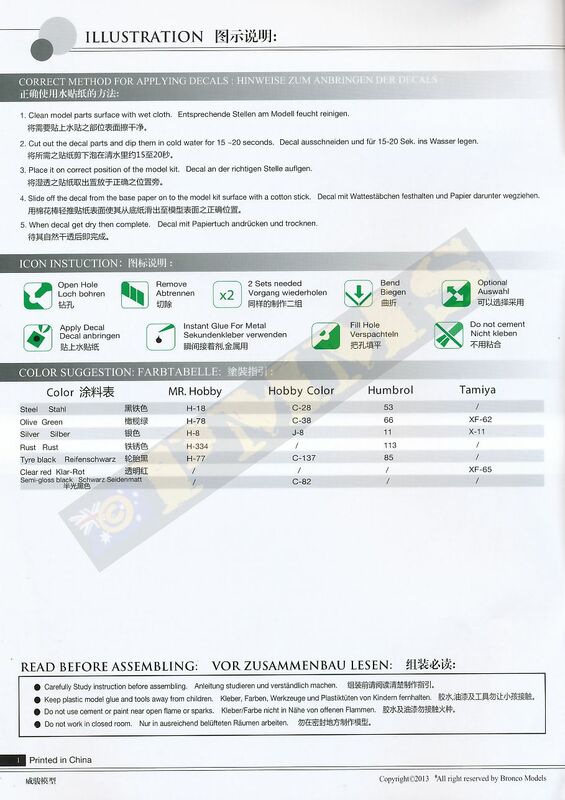 (see attached images). 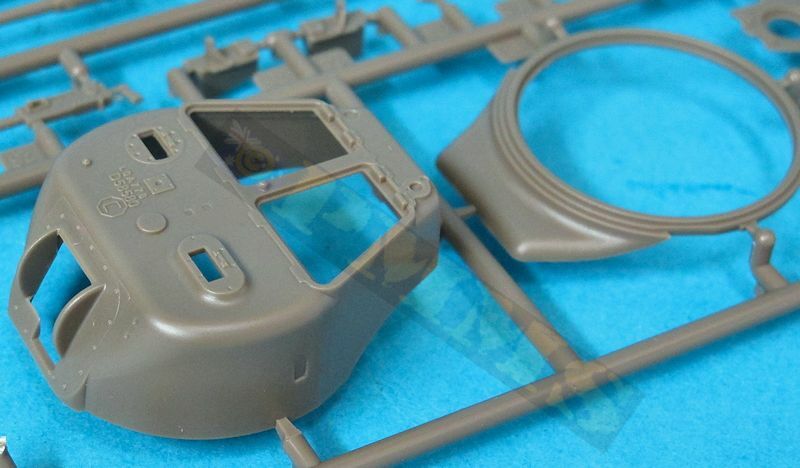 The hull has a very basic interior with the front transmission, driver’s seat and drive levers and a coupler of other smaller items, there is also a large etched cage for the left side and the rear engine bulkhead but unless you plan to show the driver’s hatch open you can skip the interior to save a little assembly time. On the left hull side is a locating hole for the inner seat and on the right side two locating holes for the inside parts, these holes will need to be filled and sanded so they are not visible from the outside. 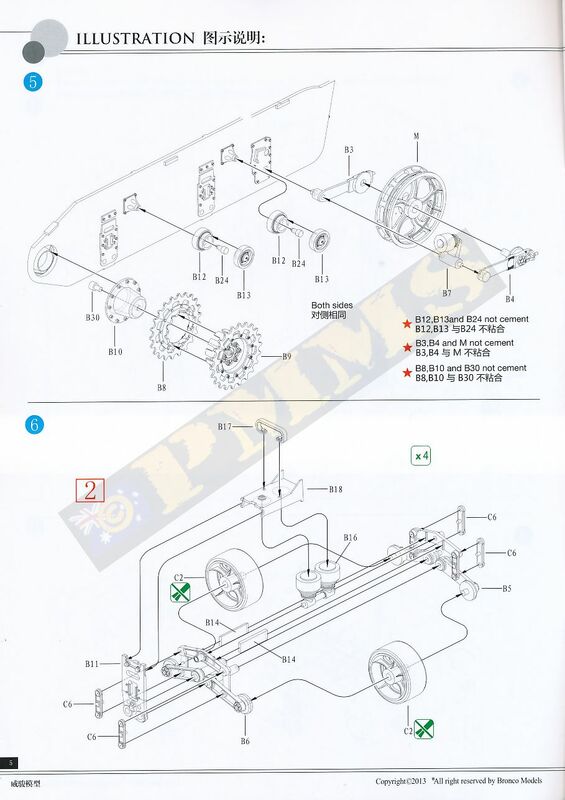 The rear plate has the moulded on engine inspection plate and the exhaust pipe mountings along with the towing lugs as mentioned above. 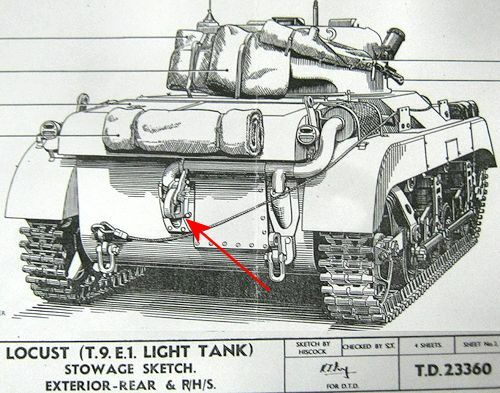 On British Locusts there should also be a large towing pintle mounted centrally overlapping the central exhaust mounting and the engine inspection plate. 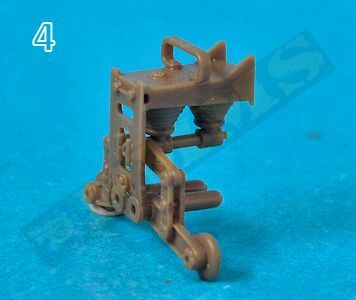 This has a mounting plate for the towing pintle and this will have to be added for an accurate British Locust, (See Reference images). 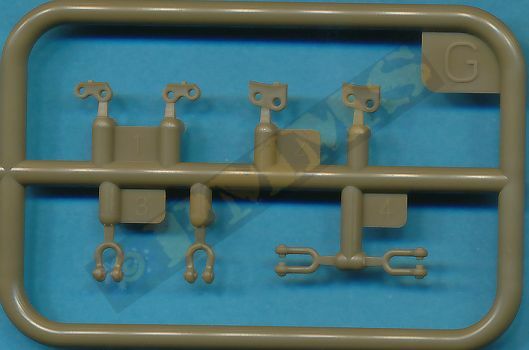 It should be noted that the towing pintle is of US design and not the usual British tow hook, therefore if "borrowing" a tow hook from another kit make sure it is the US type and not the British type such as those on Universal Carriers or British Shermans. 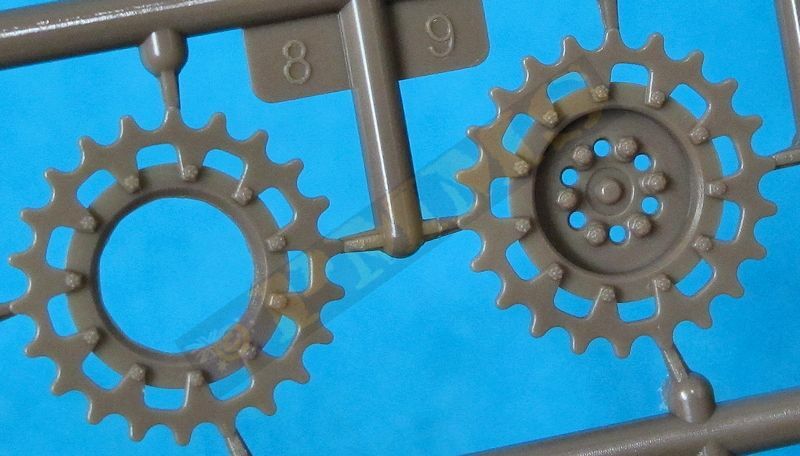 I first added a 1.6mm plastic rod pin to the inner drive sprocket after first slightly enlarging the hole on the inside of the sprocket (part B9) taking care not to drill all the way through the sprocket hub. I then enlarged the hole in the final drives to 1.6mm drilling all the way through the inside final drive housings (parts D10, D11) ensuring the holes are drilled perfectly level and square. 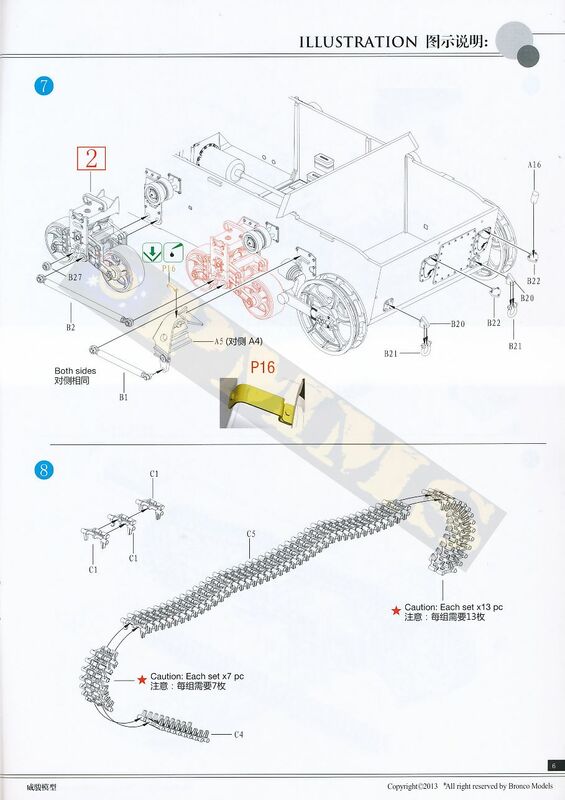 When the pin in the sprocket disc is completely dry this is simply inserted into the final drives with the end of the pin extended inside the hull. 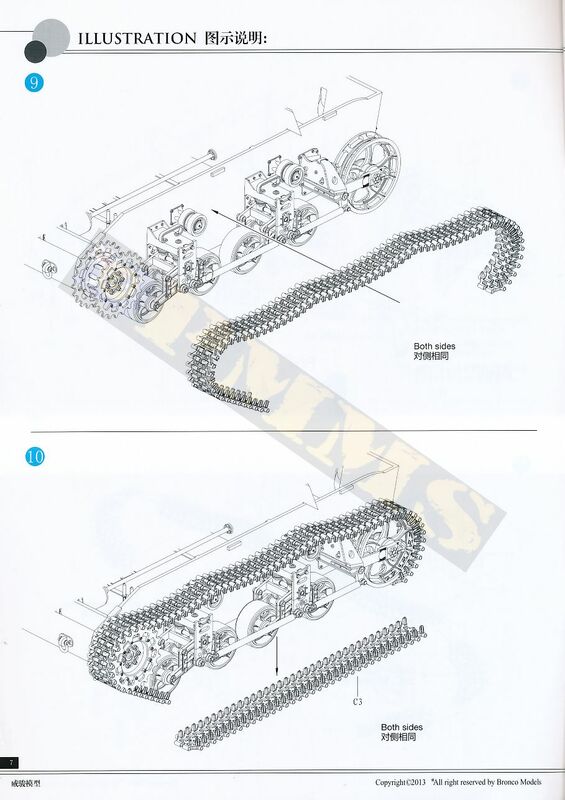 It will sit perfectly well unglued with the tracks holding it in place or you could heat melt the end of the pin to firmly fix the sprocket for a solid fit that won’t go anywhere andyou fit the track while allowing the sprocket to rotate to align with the track tooth holes. 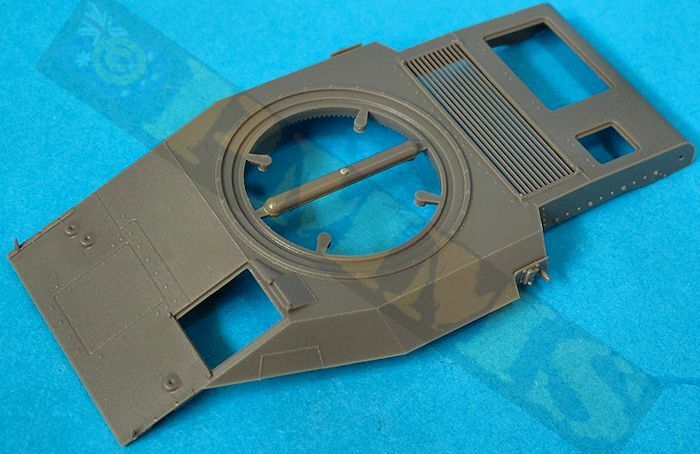 Note; I have altered the assembly of the fenders and actually attached these to the hull top instead of the lower hull as per instructions to make things easier during assembly as this allowed the other parts to be added such as the Hamilcar attachments prior to fitting to the lower hull. 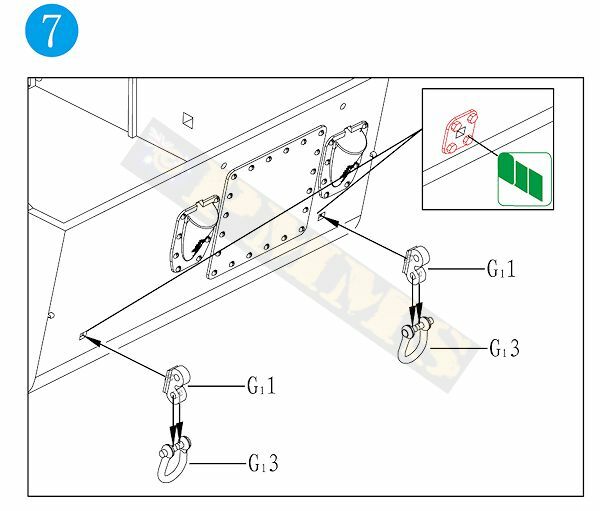 For this modification the outer overhang sections of the engine firewall (part D23) need to be removed to allow the hull/fender sub-assembly to fit to the lower hull. 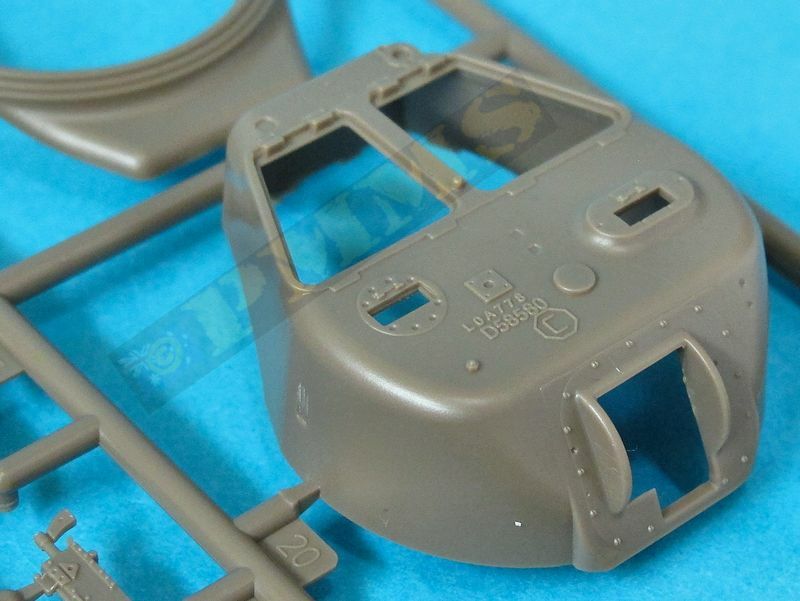 Again I stress this altered assembly isn’t required to assembly the kit as per instructions; I found this method easier to ensure a perfect fit between the fenders and hull top as well as making it easy to fit this modified sub-assembly to the lower hull. This is a single part with separate engine deck inspection hatches and separate driver’s hatch at the front. 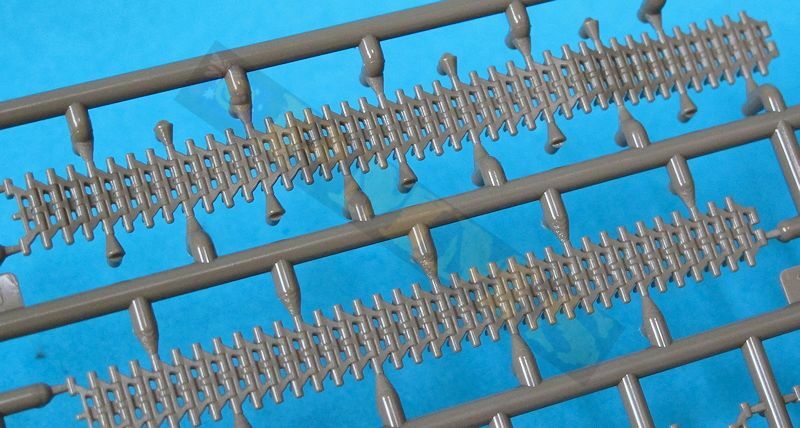 The surface detail on the hull is very subtle and well done with fine weld lines, recessed panel details and excellent raised and engraved rivet and screw details. 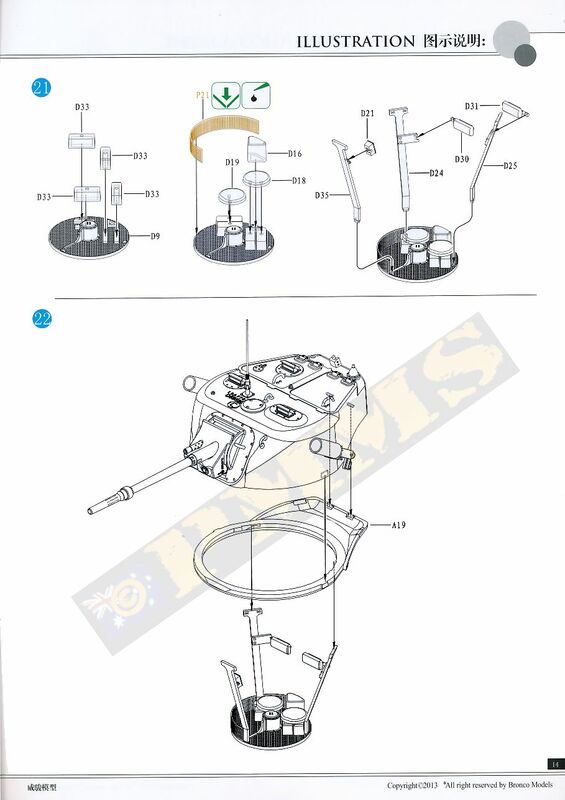 The turret ring has the outer rings included as well the inner rotation teeth although these can’t be seen after assembly and added inside the hull are the driver’s instrument panel, hatch arm and travers motor but again these can’t be seen after assembly. One nice feature on the rear deck is the very fine intake louvers that are moulded open; they may need to be blanked off from the inside to prevent the see though look as there is nothing inside the hull. Also provided is an etched mesh for the louvers but period photos don’t show this mesh and it may be a museum addition to keep debris out of the intake and it’s probably best not to fit the etched mesh for a more accurate representation. 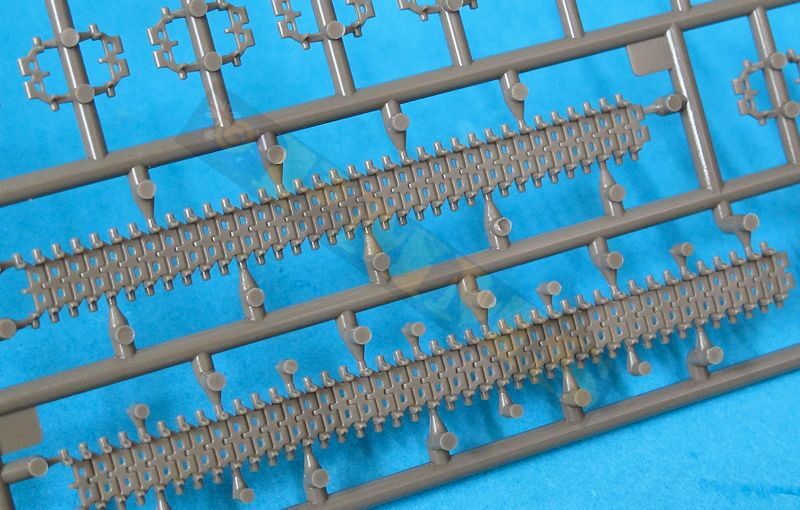 While the louvers and very cleanly done there is a small issue for those inclined, the actual Locust deck has 12 louvers but the kit only has 11, but as they are so fine I doubt anyone would notice and I only mention this as a point of fact. 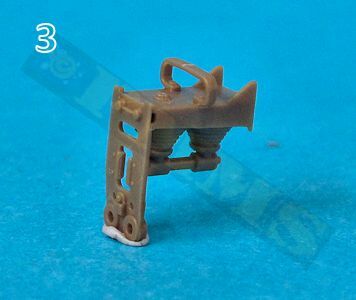 There a couple of additional modifications needed to properly represent the British Locust and these are the front mounted siren (part A37) was not fitted to British vehicles but only to US vehicles. You simply need to trim off the siren mounting from the glacis as well as the small locating ridges for the etched head light guards provided. 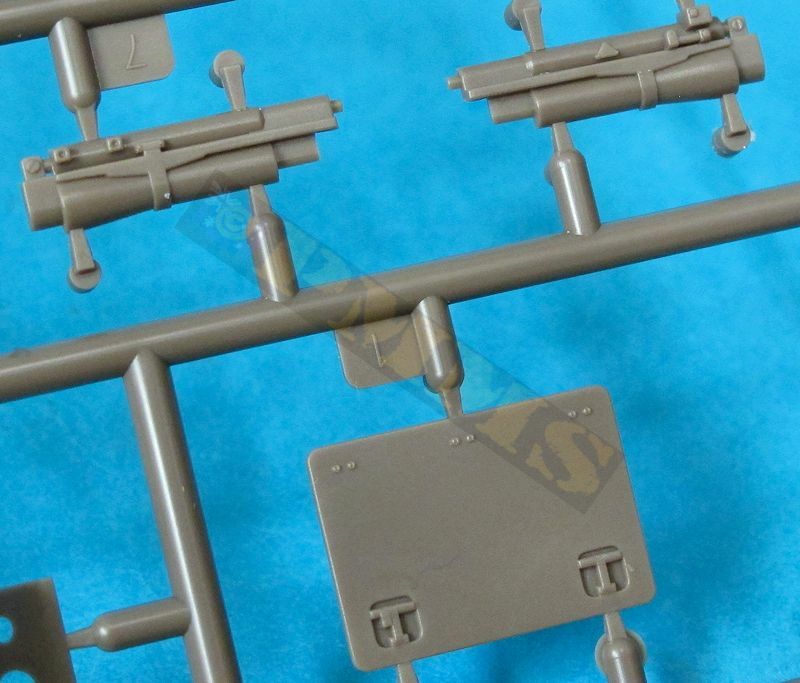 As mentioned these guards were not used on the British Locust but are present on Museum examples as they are simply US vehicles painted in British 6AARR markings. 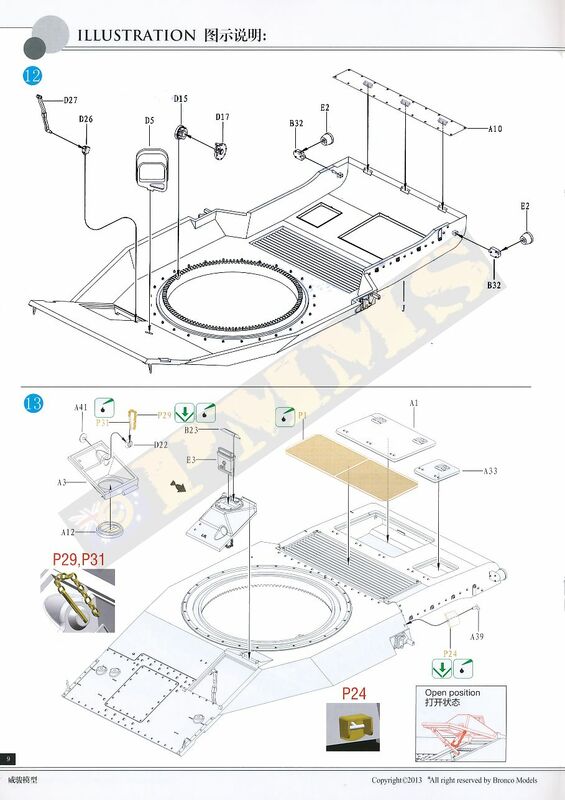 Also there should be two lifting handles on the glacis inspection hatch which can be added from thin wire. 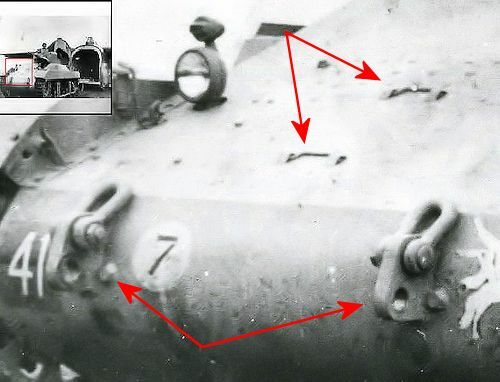 The headlights have separate clear ‘glass’ and are added to the glacis mountings without problems but it should be noted that the British Locusts had a blackout light on the left and the clear light on the right side. I have “borrowed” the blackout light from Bronco’s Jeep kit to use here. 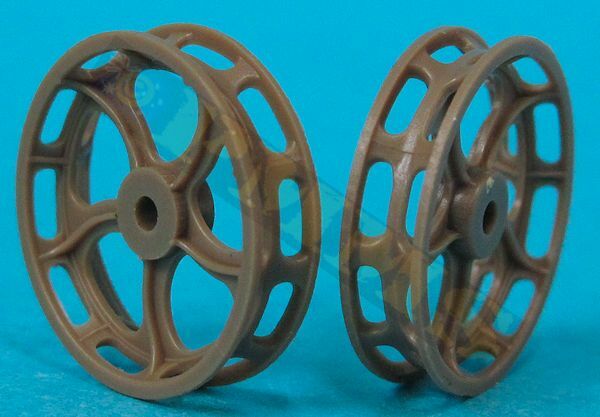 (See Reference images). 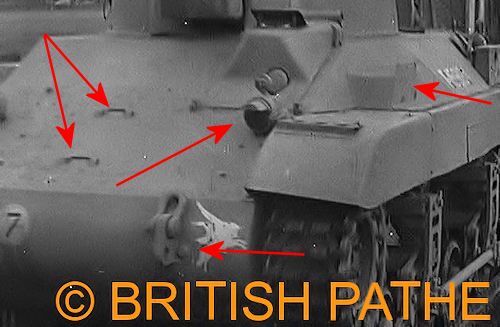 Also the British Locusts didn't have the four lifting brackets fitted to the hull sides, you need to trim off the brackets detail for the rear hull sides and from parts A24, then drill two small bolt holes and add two small bolt heads to the bracket mounting plates which remain on the hull, photos show a small first aid box added on the left rear bracket mounting plate but not to the right side bracket. 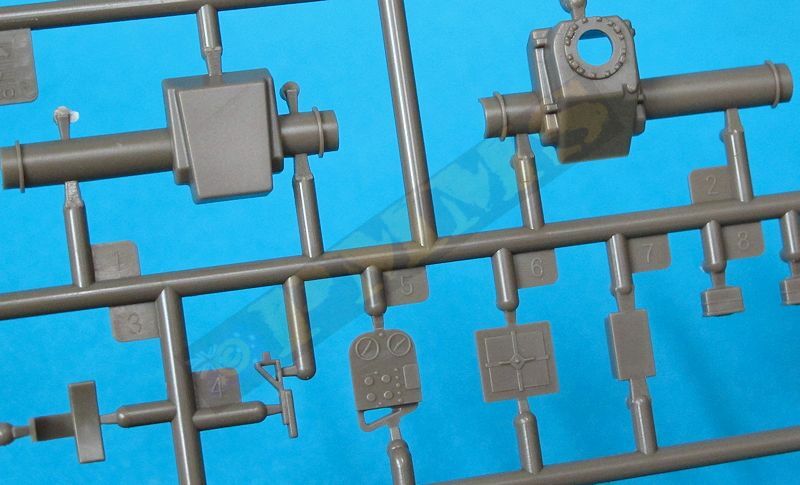 The driver’s hatch is nicely done with good contours and fine casting numbers, the top periscope mounting ring is separate as is the clear plastic periscope and also a separate small plug with inner etched chain for a good appearance. The hatch can be positioned open or closed but you don’t get the weather screen cover used when driving with the hatch open for long periods. 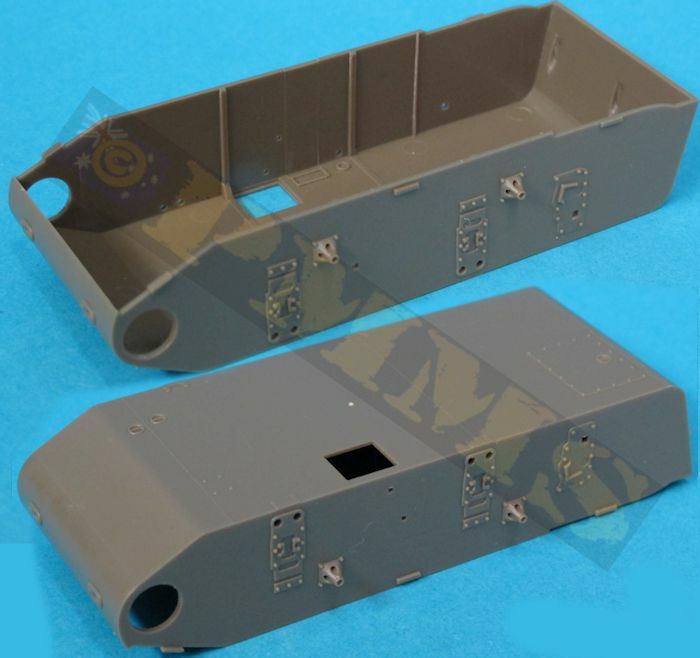 The fit of the lower and top hull is spot on without any trimming needed and once together the rear mounted exhaust pipe assembly can be added, this comes with a few etched pipe clips and etched heat guard with the correct diamond pattern mesh. This is easily curved to the right shape and fitted over the exhaust on the fender without any real problems. 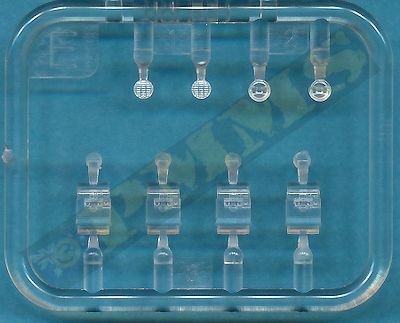 Fitting these small etched clips can be a little fiddley and care will be needed to get them positioned correctly but provide a nice appearance when fitted. 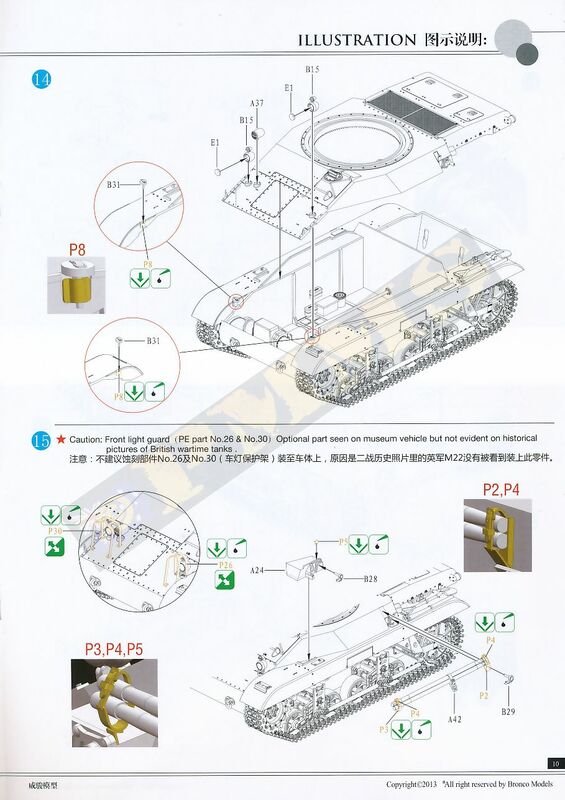 Added to the sides are two smoke generators nicely moulded with hollow tubes and these fit to the mounting brackets and then to the turret sides as indicated without any problems. 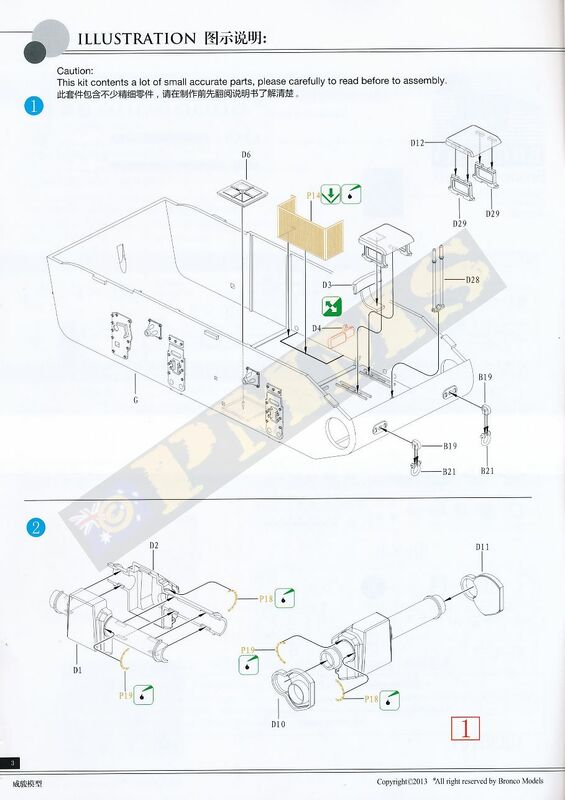 The smoke generators have two part etched handles that are very difficult to fit, 1; they have multiple engraved bend lines that don’t really match how they are supposed to look and the instructions only showing how they should look, not which bend lines to uses as it appears one is not a bend line but a locating mark for the smaller etched part . 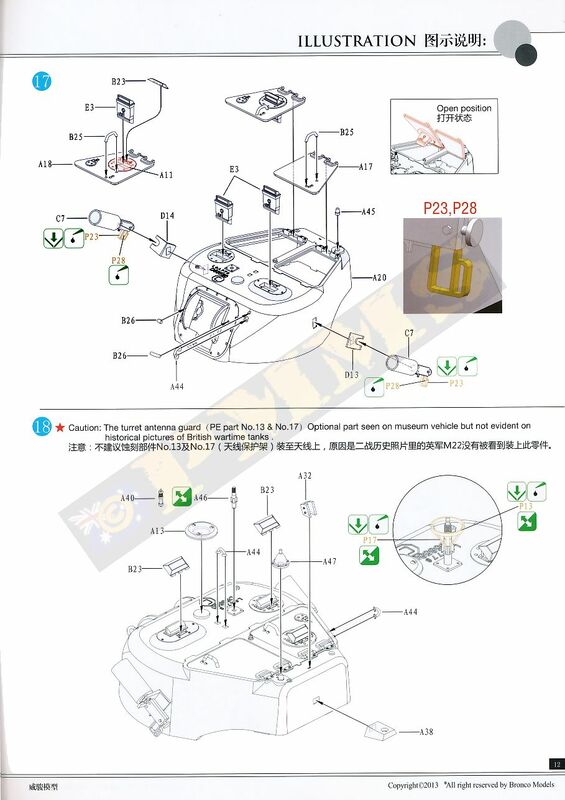 2; the smaller of the two parts are very difficult to handle being so small especially when filing the attachment bur and extreme care is needed. 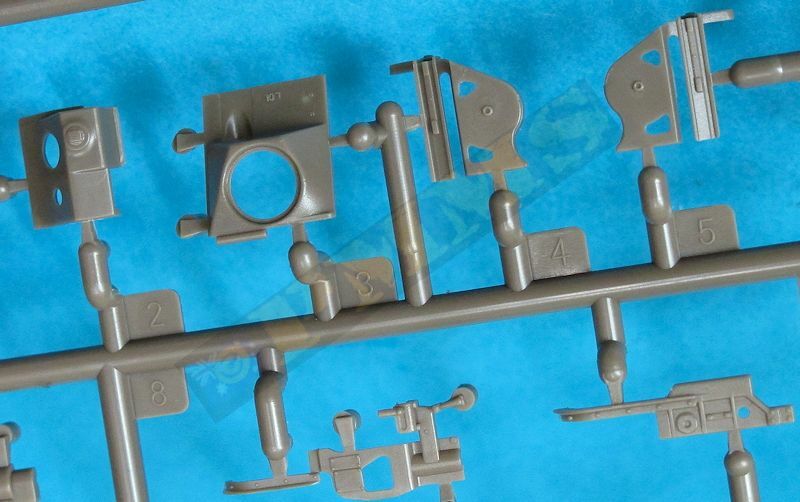 There is the full M3 gun assembly with separate breech and guard with the barrel tube separate and these parts assembly easily without any problems apart from yet again another minuscule etched part (P33) added to the rear guard. This has no bend lines and you have to ‘judge’ where to bend taking into account one side should be slightly longer than the other to sit properly on the guard. 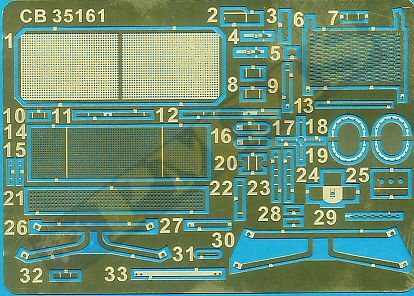 Unless you are specifically going to expose the interior, save some time and forget this etched part. 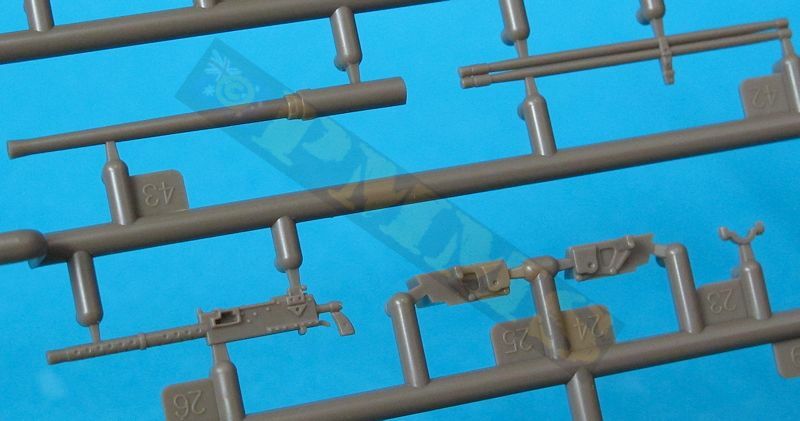 As mentioned above you are provided with alternate barrel tubes, one with the Littlejohn Adaptor and one ‘normal’ barrel but all available period photos show the standard barrel is the better option for the markings provided with the kit, but do not glue the barrel tube onto the gun at this stage. 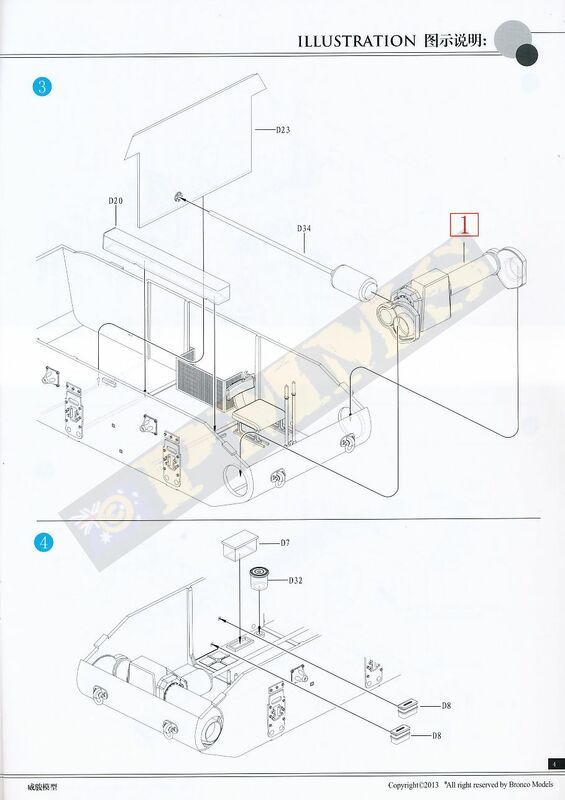 Also note the ‘normal’ barrel outer tube is 1.5mm too long and you could either cut off the barrel at the collar, trim the 1.5mm (taking into account the cut) and reglue to the correct length or replace the barrel with any of the available aftermarket M3 37mm barrel tubes. 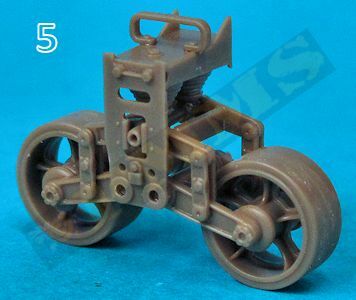 Some minor modifications would be needed to fit the aftermarket barrel as none are designed for this kit obviously. 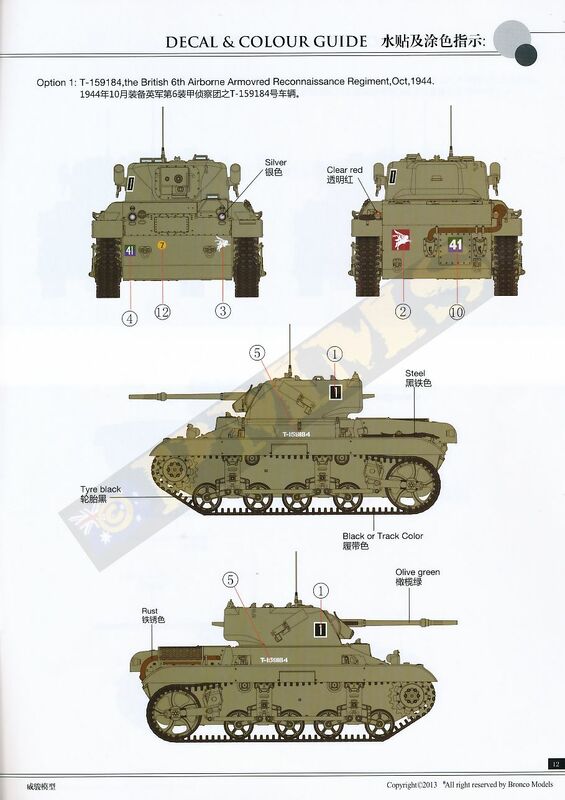 The decal sheet gives markings for three specific Locusts of the 6th Airborne Armoured Reconnaissance Regiment during Operation Varsity in March 1945. 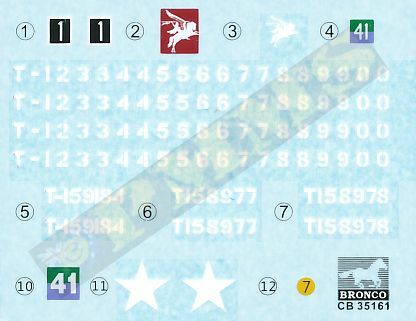 Included is the Arm of Service square although the lower blue section is far too light and should be much darker than depicted on the decal, there is also the airborne “Bellerophon” in plain white as well as with the maroon background square plus the Squadron tactical sign on the turret with a white outlined black square with the number 1 in white. 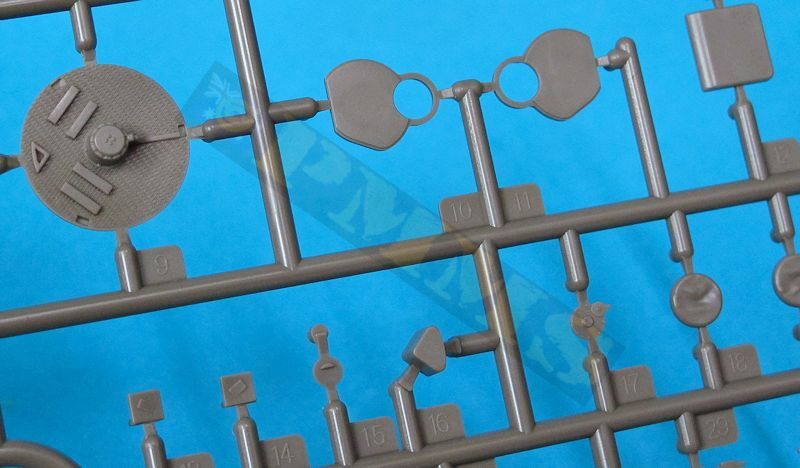 There is also the 7 bridge weight badge and two allied stars plus a selection of serial numbers that allow you to make any vehicle other than those depicted. 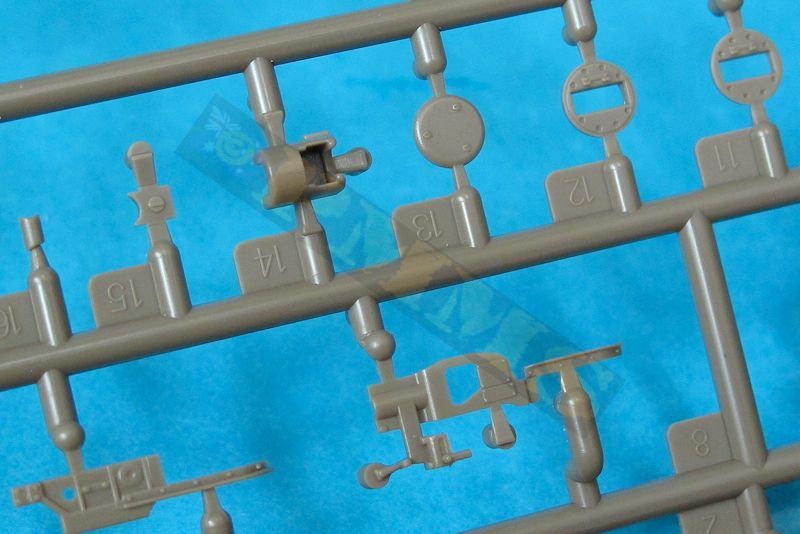 As mentioned previously, all period photos of 6AARR Locusts during Operation Varsity use the standard 37mm barrel without the Littlejohn Adaptor so this barrel is the best option to use on your model. 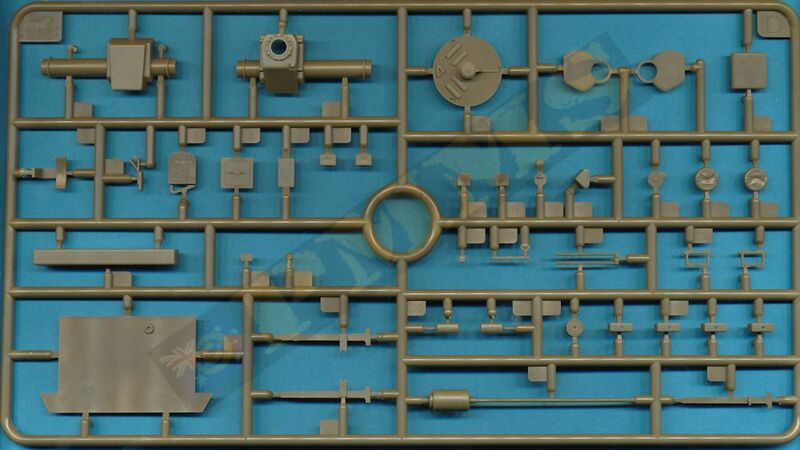 Given this is a fairly small vehicle and there are not a of parts the usual exploded view diagrams are clear and easy to follow in the main, there are a few small areas needed a little care, mostly with some of the etched parts. 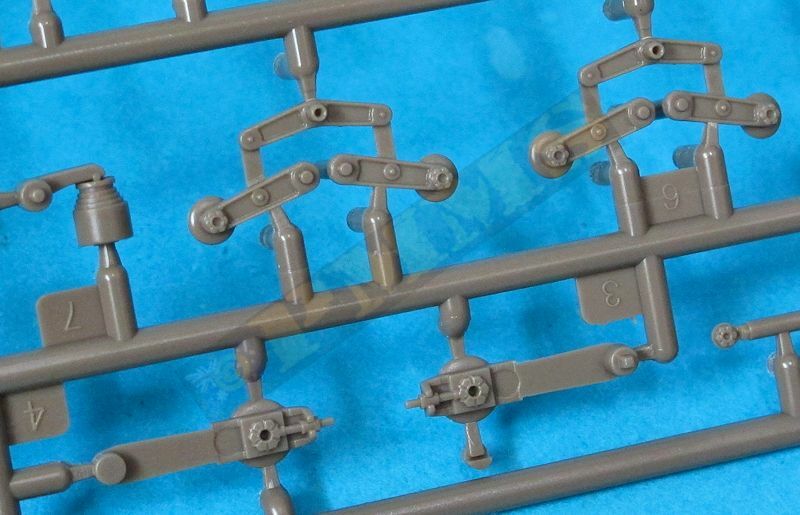 I didn’t come across any ‘bloopers’ with the instructions again probably due to the smaller number of parts, the only issue is with the late inclusion of the G sprue with the British tow lugs, there should be a small addendum sheet included in the kits for those but if not they should be fairly well circulated around the various model sites. 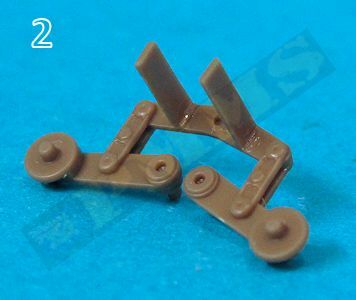 The M22 Locust is a small vehicle but with extremely pleasing looks and this kit does the Locust proud with very cleanly moulded parts that have excellent details, most notably the intricate idler wheels moulded as a single part, they are quite impressive. 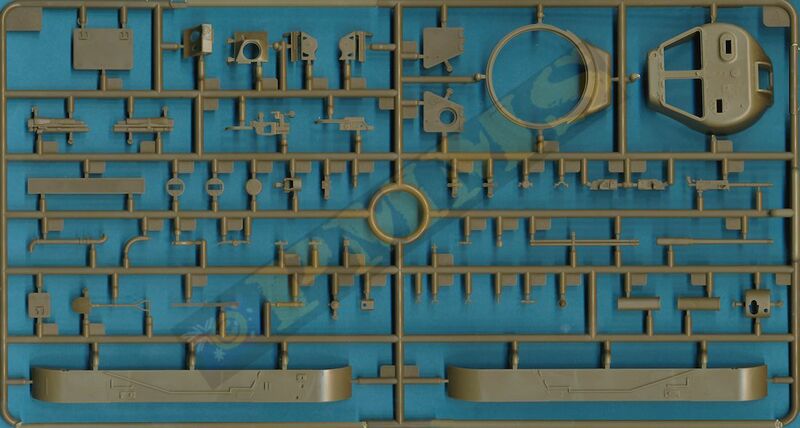 This is coupled with excellent fit overall for a fairly straightforward assembly as far as some kits go today but there are a few areas where care is needed. 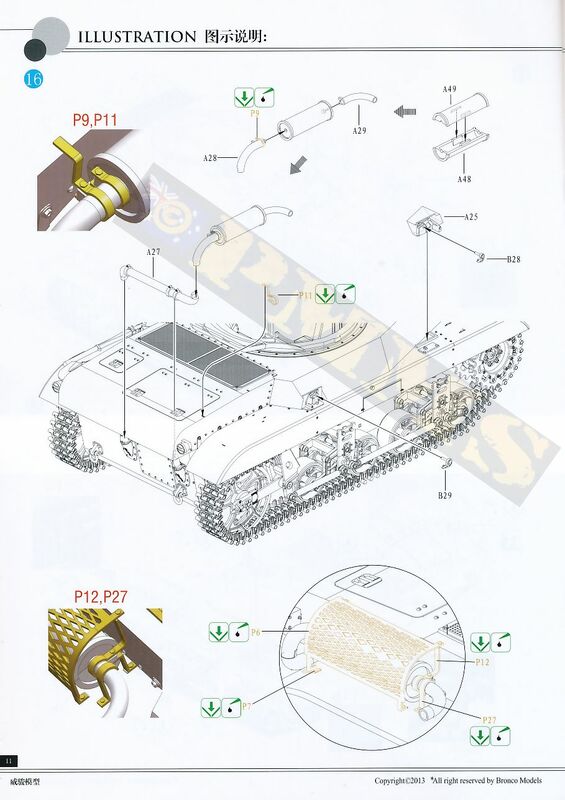 The basic kit as mentioned is of the US M22 with the additional of the British style tow lugs and turret mounted smoke dischargers, but you could quite easily build a US vehicle from the kit as the necessary parts are all there. 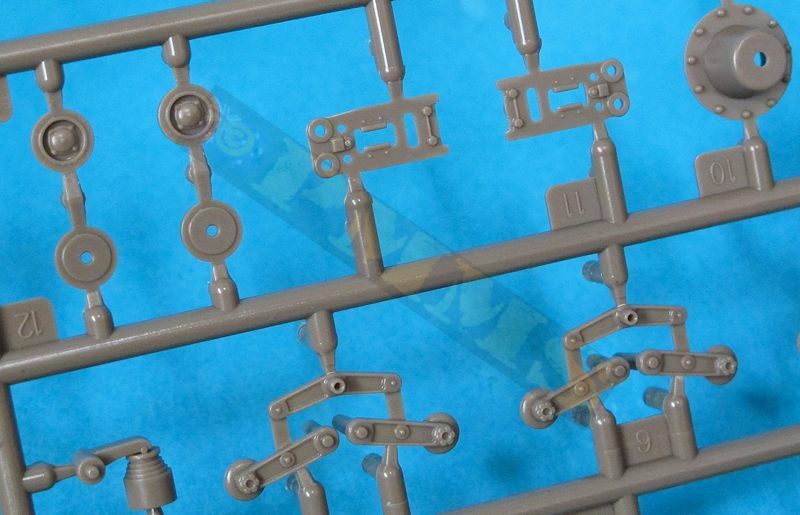 There is a bit of work needed to incorporate the British parts and some alterations required around the kit to build an accurate British Locust, but nothing too difficult or time consuming. 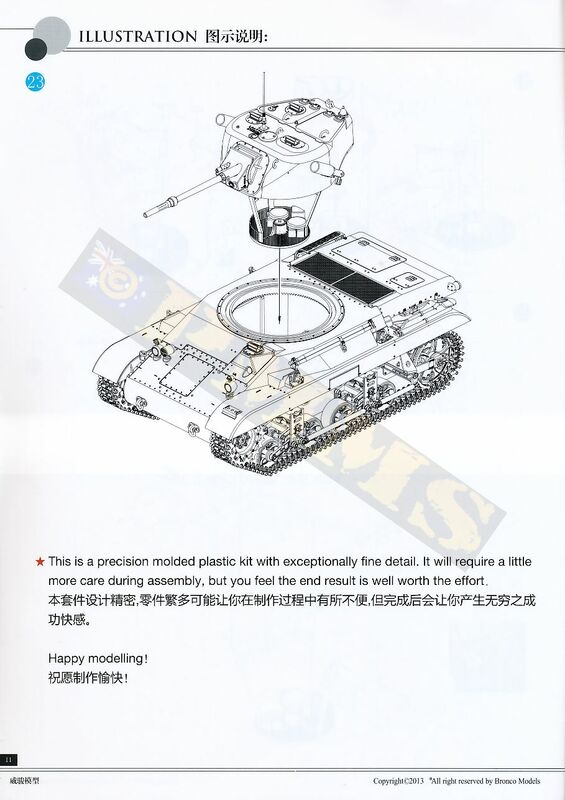 As the kit is labelled British Version one could have expected a few more of the British details to be included or identified but as mentioned the alterations required should not be beyond the average modeller? 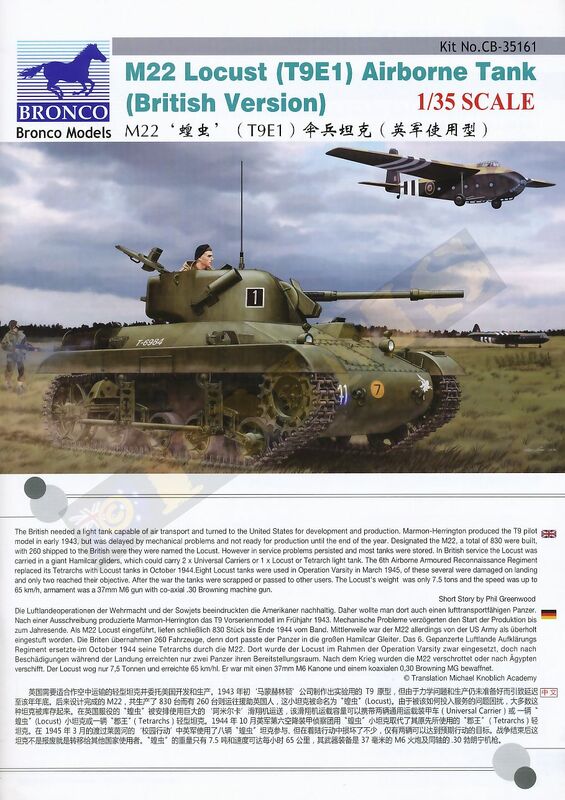 War History online - 6th Airborne Armoured Reconnaissance Regiment by Peter Brown. Thanks to and for the review kits.